Summary: Abdi Taalib thought he was moving to Australia for a music scholarship. But after meeting the beautiful and brazen Tegan Oglietti, his world was turned upside down. Tegan’s no ordinary girl – she died in 2027, only to be frozen and brought back to life in Abdi’s time, 100 years later. Now, all they want is for things to return to normal (or as normal as they can be), but the government has other ideas. Especially since the two just spilled the secrets behind Australia’s cryonics project to the world. On the run, Abdi and Tegan have no idea who they can trust, and when they uncover startling new details about Project Ark, they realize thousands of lives may be in their hands. A suspenseful, page-turning sequel to When We Wake that will keep readers on the edge of their seats and make them call into question their own ideas about morality – and mortality, too. Review: I have to say this straight out. I LOVED THIS BOOK!! So much that I read it twice and was enthralled the second time. While We Run is just that good. The first time I read it was during summer vacation and I think I read the book in a matter of hours. I couldn’t put it down. Karen Healey’s pacing in this sequel is much better balanced with heavy hitting points mixed with quiet moments between characters that really showcase the relationships in this novel. The themes Healey presents as well, such as the concept of collateral damage, she handles with skill and a deftness that allows explores the grey areas of political revolutions. Many YA dystopian novels that focus on revolution often have an “Us vs. Them” mentality and the fight is usually a “good vs. evil” trope. While Abdi, Tegan, and their friends view the Australian government as evil, through their experiences they eventually learn what it means to have to make those tough decisions and that sometimes you have to lose to win. It’s a very grown up lesson to learn and Healey presents those ideas well. The one aspect of the novel that I loved the most was Abdi’s voice. In When We Wake, I enjoyed Abdi’s presence in Tegan’s life and found him to be a well-rounded character, love interest for her. 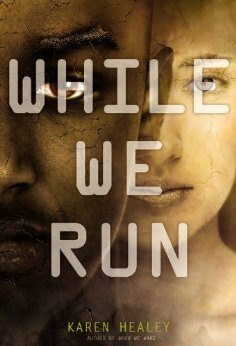 While We Run is told entirely from Abdi’s perspective and he is a fascinating character. I felt his voice is much stronger than Tegan’s, more introspective and thoughtful, owning a maturity far beyond his 17 years. He often very blunt with the reader while at the same time hiding information from the other characters. In Healey’s sequel, we get a real sense of Abdi’s inner self, what drives him, and what made him the deep thinker he is. Because he is still a teenager, he does make some stupid mistakes but unlike some YA characters, he does own up to them, eventually. He is also able to take criticism from his friends, internalize it and then work to change his behavior. I have to say that is one quality that I loved in him. Healey also handles instances of racism that Abdi experiences and comments on extremely well. These are usually comments that Abdi keeps to himself and rarely says aloud, and by doing that, Healey captured the internal dialogue a person of color usually has to racist comments or experiences. I greatly respect writers who understand that when writing cross culturally, characters of color would have to internalize their reactions to racist situations. I feel like Healey did her homework when writing Abdi and it shows; I practically feel in love with him. I don’t know if there is a 3rd book planned for the series, but I hope there is one. I want to know what happens to Abdi and Tegan next, what their future holds, and how they handle the decisions they made at the end of the novel. The world that Healey created is very believable and one that I’m not ready to leave just yet. In the meantime, I’ll just read While We Run one more time.